Chicago delegate in 1997 to the America's promise meeting in Philadelphia. I see the same reinvention of the wheel in the White House event as in the America's Promise event. How do these relate to Chicago's Principal for a Day? None use a Map to show where the greatest concentrations of at-risk youth are located and none are creating "blueprints" that visually show how business, non profits, community, churches, colleges, media and political leaders need to be consistently engaged, during the non-school hours and the summer, not just at the school from 9 to 3pm, and for many years, in order to change the aspirations, then the academic performance of kids born in concentrated, inner-city poverty. In these neighborhoods most of the community role models are people who live on welfare, or who are ex-offenders or people who make a living in illegal enterprises. Unless we expand the network of role-models we cannot change student aspirations, and unless we keep these role models connected with kids for many years, we also cannot change what adults are willing to do to help kids move through school and into jobs. Without a map, such as I show in the Program Locator at http://www.tutormentorprogramlocator.net a city will never be able to build a strategy that supports the growth of needed tutoring/mentoring in every poverty neighborhood. And, without using visual blueprints, similar to the Power Point essays I show at the Tutor/Mentor Institute section of the same web site, people won't differentiate between the various types of services that are needed, and which need to be available in age-appropriate format, to kids in every neighborhood as they grow up. Finally, what disappoints me even more, is that there are too many people holding conferences that draw attention to significant issues, are not using the Internet to encourage contact, networking, interaction and engagement among the people who attended and those who might have just heard about it in the media. I'm hosting a Tutor/Mentor Conference on Nov. 17 and 18. This will be the 24th time I've hosted this in Chicago since May 1994. The goal is to help people build and sustain comprehensive, mentor-rich programs in all high poverty neighborhoods of Chicago and other big cities. 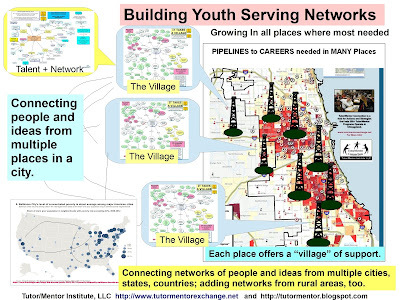 (We have people attending who come from rural areas of high poverty, where the lack of mentors is the same, but geography poses different problems of how to create programs that connect youth and adults.) I hope some people who attended the White House event will find http://www.tutormentorconference.org and want to attend. However, if they cannot come to Chicago, they can also go to our web portal and join the on-line discussions that run parallel to the face to face event. No matter where someone is in the world they can connect on line. And if we can find help to facilitate these discussions we can lead a process of what works well in some places, and what needs to be done so those good ideas can be working well in all the other places where they are needed. We don't need any more community needs assessment. We need leaders in communities who will build maps showing where the problem is, what organizations are in the neighborhoods already trying to end poverty by helping kids go to school and get a job when they leave school. And we need leaders who will use these maps, and their personal and professional visibility and leadership ability, to regularly encourage volunteers, donors and business leaders to reach out and become long-term partners to help these programs achieve their goals. At the same time communities need to use the maps to learn which neighborhoods have high needs, but are missing some of the needed services that are available in other neighborhoods. Using the knowledge we have of existing programs, community and business partners can borrow ideas from what works in some places, so new programs don't reinvent the wheel, but start out with the collective experience of everyone else who has already been doing this work for many years. Using their high visibility, the White House, CPS and the Mayor could give daily visibility and leadership to this strategy. As a result we'd have a lot more people involved in all the places where they are needed, and where non profit leaders are struggling just to pay the rent to keep their programs alive. If we keep them involved long enough, we'll begin to see a change in student aspirations, student performance, and the ability of more kids to leave school prepared for careers. I outline this Theory of Change in a Power Point essay that can be found in the Tutor/Mentor Institute section of the web site. I hope you'll comment, or pass this on to others who want to help kids. As charities vie for donations, how can we help donors navigate the choices? Last Wednesday the Chicago Tribune had a front page/back page story devoted to Breast Cancer Month. The goal of the article was to help donors choose which charity to support. It was a great article, and great exposure for Breast Cancer charities. Pick a goal. It might be research toward a cure, or advocacy, or patient support services. Then pick a charity that serves that goal and stick with it. The article quoted Sandra Miniutti of Charity Navigator who said "We tell donors, if they want to change something in the world, they need to develop a relationship with the charity. Continue to support them over time, so they can keep their costs down and track whether they do what they claim to be doing." In a blog I wrote in May, I posted an article showing how difficult it is for non profits to sustain their work because of the inconsistent flow of dollars cause by a system that does not support flexible, long-term problem solving very well. The Tutor/Mentor Connection focuses on connecting workplace volunteers with inner city kids in long term programs that result in the kids starting jobs/careers by age 25, with the volunteers still connected and helping to set up job interviews. If a youth joins such a program at age 10 it takes 15 years to achieve this goal. Unless donors chose charities that offer this service and stick with them for most of these 15 years, it's not likely that the program will survive long enough to still be a meeting place for a youth and adult at a time when the youth might be looking for help finding a job. This is one of the on-going topics of the Tutor/Mentor Leadership Conferences, held in Chicago every six months. The next conference is Nov. 17 and 18 and we're looking for people to participate and share their ideas. We're also looking for people who will blog the conference, or who will help organize on-line workshops that continue the conference topic on the Internet. If you'd like to help build a better system of supporting on-going operations of any non profit, please join us. Million More March. Here's a Plan. On Oct. 14, 2005, I read a column from the Chicago Tribune, written by Dawn Turner Trice, titled, "Only real plans make a march a movement." She was referring to this weekend's Million More March. She said, "I wonder what the legacy of this march will be?" After the first Million Man March 10 years ago, we had a few new people to come in and volunteer at Cabrini Connections. However, most did not stay for long. 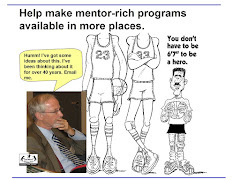 Mentoring takes a lot of commitment over many years. In a small program like ours, that commitment needs to extend to fund raising, leadership and other organizational activities, if the organization is to do all it needs to do to help kids move through school and into jobs and careers. I wrote after the last march that I wished there were one person on each bus coming back from DC with a Directory (like the Program Locator at http://www.tutormentorexchange.net) listing tutor/mentor programs in the city where that bus was headed. During the ride back that person could be talking about the Theory of Change offered by the Tutor/Mentor Connection, which focuses on getting more people consistently involved in helping kids in poverty neighborhoods grow up and enter jobs/careers. He could have used maps, like the T/MC creates, to show where poverty and poor schools were located in each city, and where existing programs were located. He could have been teaching the marchers about the constant need each program has for operating dollars, tech support, training and business partners who provide vocational learning, and leadership. He also could have been talking of ways churches, businesses, universities and hospitals could be partnering in sections of a city to launch new programs to fill voids. Then, as each person got off the bus he could have asked for a pledge that each marcher would reach out to become a supporter of one or more programs, in one or more ways. He could have asked for the Independent Sector's pledge of GIVE Five!, which is five hours a week and five percent of income...not to the church, or the Million Man March, or to the campaign of a political candidate, but directly to a charity helping kids go to school and move to careers. Finally, he'd ask for a commitment that these people would go to an on-line documentation system like the OHATS at http://www.tutormentorexchange.net where they would document actions that each had taken to build or sustain volunteer-based tutor/mentor programs in their community. The last piece of information would be a web site address, such as http://www.tutormentorconnection.org, where the volunteers could go for more information about poverty, about mentoring and tutoring, and where they could talk to each other in on-line forums. This would also have provided a date and location for a follow up meeting, such as at the Nov. 17 and 18 Tutor/Mentor Leadership Conference in Chicago. This was not the plan in 1995. I don't see any evidence that it's the plan in 2005. However, if you read this, you can pass it on to people who were in Washington this weekend. Maybe some will adopt this as their follow up plan.